At the airport, everyone from ground-staff to policemen were wearing something very close to knee-length bathing robes; little later we realized this was Gho, the national dress. My parents were telling us the story of a man before them who was about to be sent back for some reason. 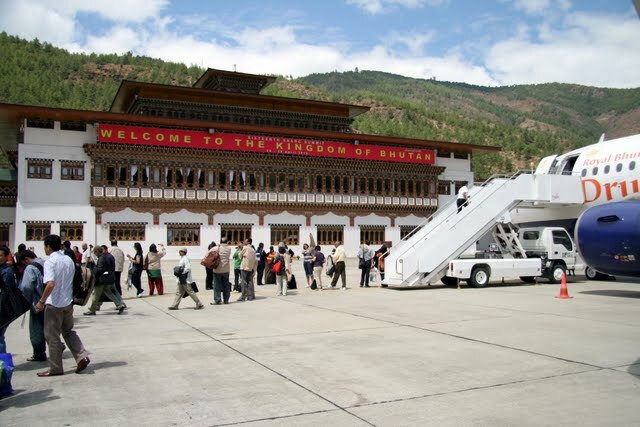 I think, unless you’re travelling on business, you can’t enter Bhutan without a package tour. Out of immigration & customs, we were welcomed by our tour guide Kinley Tensin (right! Same as the mineral water brand in India. In fact, he leveraged the fact to help us get used to his name). 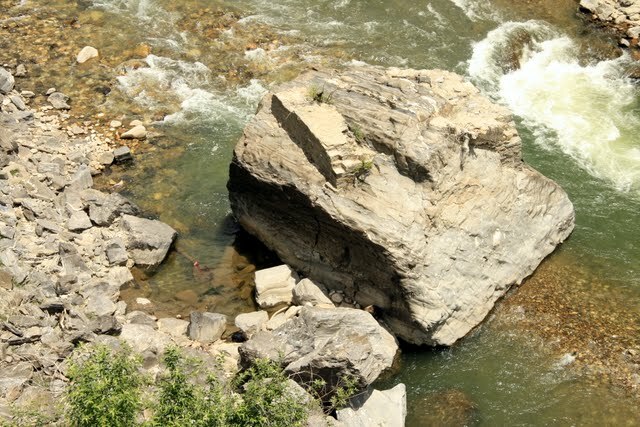 On our way to Thimpu we experienced the confluence of the Paro & Thimpu rivers at a point where 3 stupas or chortens were laid – in the Nepali Badrinath style (has a Shiv-ling-like dome), Tibetan style (marked by the crescent moon) and the Bhutanese variant (2 storied). We were awestruck by a monastery with a orange tree that bears fruit all year long. Kinley kept telling us about the influence of Indian cinema & television on Bhutanese. They’ve had case of divorce & misbehaving saas-bahus thanks to our prime-time shows. They watch cricket, but nothing beats their love for Anu Malik in Indian Idol. On arrival at our hotel, we served great Indian food – bhindi fry, fish fry, mutter paneer, chicken masala with hot naan. We soon set out for the textile museum & a handicrafts gallery. Scary masks are a common sight – they are used to develop a fear of death and to prepare people for the kind of faces they will see in the court of Yam. After a short nap, we set out for what we love doing most, walkin’-shoppin’. We got some local produce as well as some from Thailand. For dinner, we tried Chinese which was just so-so; it is only our variant of Chinese that is so Indian – perhaps, the only thing influenced by the ‘hindi-chini bhai bhai’ campaign. After a long time we had time for some family talk & we spent over an hour doing that.